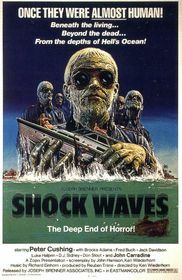 The premise of Shock Waves is quite basic -- a group of tourists find themselves shipwrecked on a remote island with a former SS officer (Peter Cushing) who hides a terrifying secret. The screenplay (by Wiederhorn and John Harrison) enhances this simple set-up by introducing the film's antagonists in a pre-credits sequence. This prologue (which uses narration set against a still photo of Nazi soldiers) gives the viewer a sense of historic accuracy that helps establish a semblance of plausibility for the picture's primary threat. It is explained by the narrator that during the second World War, Nazi scientists, obsessed with the supernatural, created a squad of super soldiers with an inhuman capacity to kill known as the Death Corps. It is also noted that no member of this unit were ever captured by Allied forces. 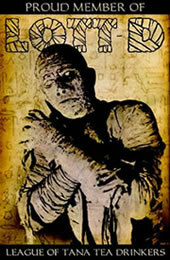 The writers also make some interesting choices concerning the film's undead. For starters, their zombies prefer to drown or strangle their victims. The overwhelming desire for human flesh which had been popularized by George Romero in 1968 is, in effect, replaced by a murderous intent. The screenwriters also give the undead the capacity to function underwater, which at the time was somewhat unheard of as prior to Shock Waves the only example of aquatic zombies of particular note was in 1957's The Zombies of Mora Tau. One other bit of inventiveness lies within the method of dispatching the living dead. Instead of a bullet to the head (which had become the normal means of termination, thanks again to Romero), the only way to stop the film's Nazi zombies is to remove their sinister black goggles, exposing them to sunlight which causes them to wither and die. On the technical side of things, Wiederhorn employs two cinematographers- one above the water (Reuben Trane), and one below (Irving Pare). Both of these men do an excellent job, despite restricted funds, and provide many visually striking shots. Whether it's Trane capturing the image of the zombies rising from the depths, or Pare's slow motion shots of the undead walking among undersea wreckage, the camera work here is never less than exceptional. One of the film's many visual highlights is the discovery of the dead captain (John Carradine). As members of the shipwrecked party row a small boat with a fiberglass bottom towards shore, the captain's body suddenly comes into view through the bottom of the boat. It's a shocking scene made all the more creepy by Trane's close camera angle which shows the body in full detail as the boat passes over. The film's low budget also has no effect on Shock Waves' iconic undead. The look of these unforgettable monstrosities can be attributed to costume designer Jacqueline Saint Anne and make-up artist Alan Ormsby. Saint Anne's talents would go on to serve her well in the world of television and it's her attention to detail that allows the uniforms worn by Wiederhorn's teutonic terrors to have an accurate feel. From the lightning bolt insignias on the collars of the zombie's shirts, down to their signature Nazi jackboots, every aspect of the costume design rings true. The most chilling feature of their outfits are the eerie black goggles, which give the undead an almost robotic appearance that further accentuates the fact that they were created to serve as mindless killing machines. Alan Ormsby has worn many hats throughout his career (actor, director, producer, writer), but during his early years he was a competent make-up artist. In the early 1970s, he displayed his talents on such films as Children Shouldn't Play With Dead Things, Deathdream, and Deranged. For Shock Waves, Ormsby uses practical appliances to punctuate the Nazi's frightening visage and creates what can easily be considered his finest work in the field. His zombies feature a withered, waterlogged look which eschews the heavy look of decay often favored for the living dead. The highlight of his make-up design can be seen when the zombies goggles are removed and massive deterioration sets in. Without the benefit of darkness to enrich the film's atmosphere (most of the story takes place in broad daylight), Richard Einhorn's score becomes an integral part of the picture's tone. The composer uses high pitched sounds and dissonance to create a creeping feeling of unease that saturates every frame of Wiederhorn's feature. Although some scenes are augmented by the music (such as the zombies sudden ascent from the depths), the soundtrack is used more as a device for setting mood, and the haunting sound-scape that Einhorn achieves through his experimental, electronic compositions are the perfect fit. The film achieves a certain level of distinction thanks to the presence of two of the genre's favorite actors, Peter Cushing and John Carradine. Both actors are in fine form, delivering quality performances despite limited screen time (on Blue Underground's DVD commentary track, Wiederhorn explains that he could only afford each actor for four days which makes this somewhat understandable). Cushing and Carradine's distinctive talents for characterization gives depth to roles that under normal circumstances would be nothing more than mere cameos. Their casting makes Shock Waves a classier production, and was no doubt vital when it came to generating interest in the film. Despite the fact that the sub-genre still persists (see the recent comedy Dead Snow), Shock Waves remains the standard against which all Nazi Zombie films are measured. Much of this can be attributed to the film's unforgettable undead, but Wiederhorn's ability to construct a tight, professional looking feature with minimal funding also deserves a fair share of the credit for the picture's cult appeal. Submitted by pete medina (not verified) on Sun, 2011-08-28 12:01. Very good review. I own this dvd and watch it a lot, audio commentary is fun, and I think this is a classic movie.